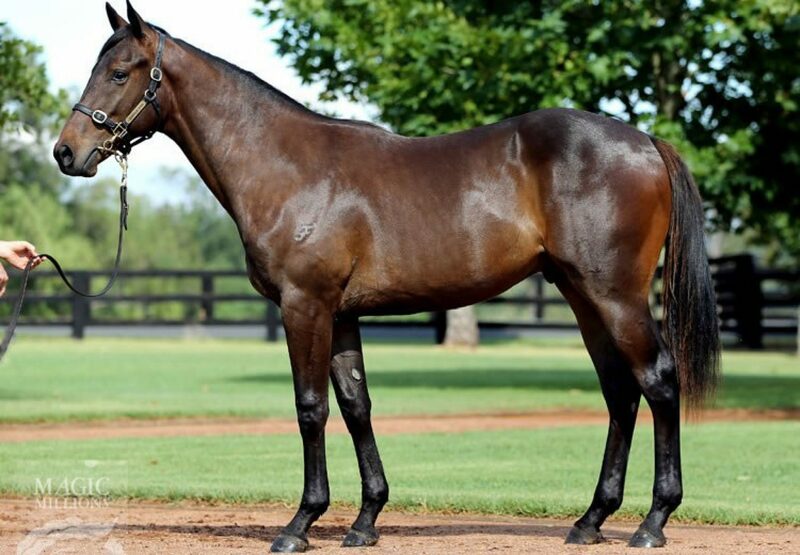 Stellar youngsters by Golden Slipper winner Pierro were the headline makers at the 2016 Magic Millions Yearling Sale at the Gold Coast on Friday with a colt from Skates fetching $1.5 million and a filly from Monsoon Wedding selling for $1.4 million. Consigned for sale by Segenhoe Thoroughbreds on behalf of John Camilleri’s Fairway Thoroughbreds, the colt from Skates was bought by Coolmore. He is a half-brother to Golden Slipper winner Vancouver, who will stand at Coolmore later this year when he retires and also Group I winner Juste Momente. Bidding opened at $500,000 and progressed in $100,000 increments until the hammer fell in favour of Tom Magnier at $1.5 million. "We’re delighted to have the horse, we know the family very well and obviously we’re very excited about Pierro,” Magnier said. "The one good thing about racing horses down here is we have some great partners we race with and we’ll put a partnership together for this colt, "We’ll take the horse home, have a think about a trainer and go from there, "It’s a very good individual from a very good family by an exciting young stallion so we knew we were going to have to pay for him - hopefully we got it right.” The Monsoon Wedding filly was consigned by Coolmore, who bought her dam at the Teeley Assets Dispersal in 2014 for $2.3 million and was bought by James Harron Bloodstock / De Burgh Equine on behalf on behalf of John Sikura of Hill 'N Dale Farm in Kentucky. "She’s been bought by a new American buyer who is pretty new to Australia,” Harron said. "We are very keen on this family - it’s so hard to get your hands on it and that was about what we thought she’d make.” The dam of four stakes performers including Group III winner Precious Lorraine and stakes-winner Lucky Raquie, Monsoon Wedding is a full sister to Redoute’s Choice and is now in the Northern Hemisphere where she is due to foal to Galileo. After session three, Pierro has powered to the top of the first season sires by average list with 36 yearlings averaging $263,750.